color or black & white ads in NewsLine. NewsLine is a monthly newsletter focusing on various pertinent issues within the energy industry. Topics include government relations, state & federal regulations and laws, cost-saving ideas, tax & financial issues and upcoming Alliance events. 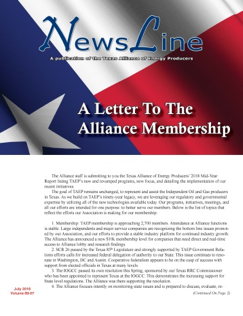 In membership surveys, NewsLine is always rated as one of the top benefits of Alliance membership. Your company’s ad will get results! Circulation: Your company will reach over 2,600 industry leaders in 34 states each month. Convenience: You can change and update your ad as often as you wish – at no additional cost. In-House Production: Provide the text you want in the ad as well as a high resolution logo and/or photo(s), and we will design a new ad for you – also usually at no additional cost. Value: Cost-effective advertising is available to any size company. Many of our advertisers have been running an ad in NewsLine for 15+ years. It really works! Senior Vice President Jo Ann Baker at (940) 723-4131 x 17 or [email protected]. Various sponsorship levels are available at each Texas Alliance meeting, conference and golf tournament. Your company can also participate as an exhibitor or sponsor at the Alliance Oil & Gas Expo and Annual Meeting, held each year in Wichita Falls.